Huge storms are born around the globe in all the oceans and seas to live a life that follows these events and be able to ride the very tail end of an open ocean swell is surfing. To connect the dots between paying the rent, attending required social moments, and being accountable to those loved ones that matter and still pursuing the passions of surfing; that is the art of surfing. Inspired by Balinese dancers, indigenous cultures, and every generation of athlete expanding the thoughts and possibilities of wave riding. 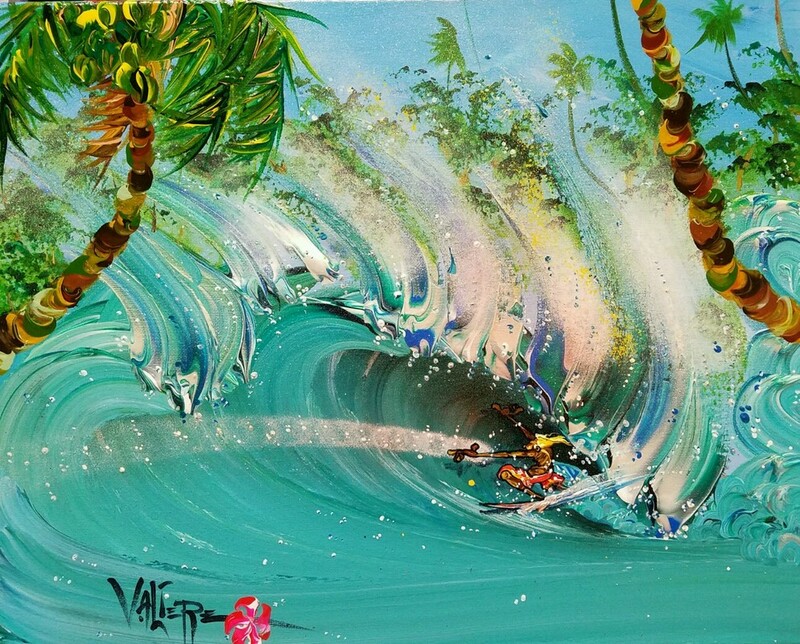 Surfers in Valiere's paintings can have green hair tattoos and be running thru the jungle or sailing the open seas in search of another day of avoiding the constraints of life with boundaries and timelines. Steven Valiere spent his youth in southern California during sixties. Rock‘n’roll was the heartbeat behind race riots and Vietnam. Surfing had already rooted. A trip him to the north shore of Oahu in 1970 was the unforgettable experience that changed his life forever. Steven had taken art classes in high school to raise his grade point average up a bit. So with creative juice flowing and the carrot of beautiful waves to ride, Steven left home with a promise he would never keep, to return to college "in a year". Almost six years later, after a romantic tour of Hawai`i, Peru, Brazil, South Africa, Australia, Indonesia, and Papua New Guinea Steven returned to the Hawai`ian Islands where it all began. 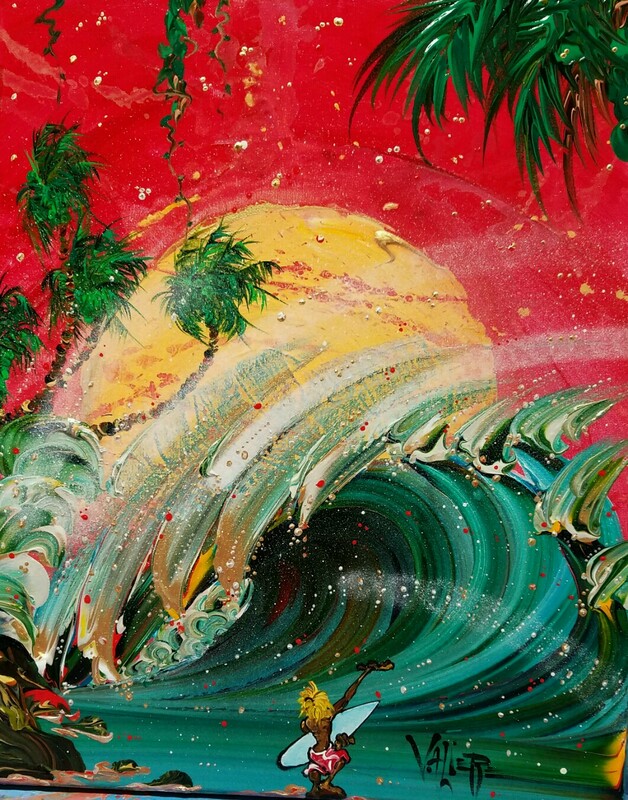 Having received so much life force from where surfing had lead him, the adventures which became stories have now become paintings. For sure all of the paintings are of a biographical nature. Steven is in there somewhere. Riding waves for over fifty years, all over the globe his path has been his reward. Now, Steven is sharing what he can through his paintings, wishing all a quick smile with a wink. Steven has been living in the Hawai`ian archipelago since the mid/late 70's, currently residing on the island of Kaua`i, he still travels "whenever he gets the chance" sometimes with his two sons who also share his love of the surf. Every new trip has a story that may someday become an inspiration for a "memorial" piece. EZ EZ and enjoy. Peace. Aloha.